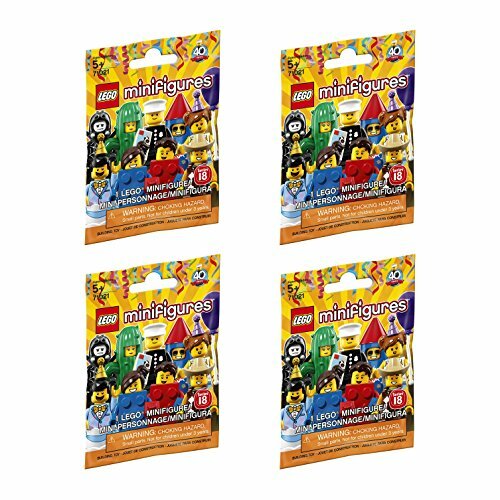 These 4 minifig packs have some amazing minifigures and you might just get lucky by getting a cactus girl, a Lego brick guy, a spider person and many more! Sadly we could not find one bag so we hope you have fun with four. EXCITING 4 PACK of the Lego Minifigures Series 18 Set! BRAND NEW, SEALED BLIND PACKS make opening each minifigure an exciting surprise. EACH PACK IS A RANDOM SET of 4 minifigures. You may receive 2 or more identical mini figures. LEGO MINIFIGURES SERIES EIGHTEEN contains these awesome figures: Dragon Suit Guy, Firework Guy, Elephant Costume Girl, LEGO Brick Suit Guy, LEGO Brick Suit Girl, Cactus Girl, Party Clown, Cake Guy, Unicorn Guy, Flowerpot Girl, Birthday Party Girl, Birthday Party Boy, Spider Suit Boy, Cowboy Costume Guy, Race Car Guy, Cat Costume Girl and, last but not least, a rare replica of one of the first minifigures ever produced-the 1978 Police Officer. This series has a very rare replica of the 1978 LEGO police officer. It also has two brick people. Their costumes are compatible with real bricks. you can even stick the bricks together! The brick bodies are not stuck to them they are like torsos that slide on and off. We are now going to show three of the LEGO characters that you might get. The party clown is the balloon tying master with two green and pink transparent balloons, that look like their poodles but its up to you. The green transparent balloon animal is a little less clear because you can’t see through it very well. The party clown also has two tail things on the back that are similar to the ones the jocker has. This flower girl is really natural looking with her clothes and her pot and her flower, and I bet you could put her in a lego nature seen and no one will notice. Without the pot on her, she can be a normal minifigure that can walk and move her arms. Her pot can easily slide off. Without the pot or the flower, she has brown pants a vine shirt and a happy face!